57 Thank God that he gives us the victory through our Lord Jesus Christ. 58So, then, brothers and sisters, don’t let anyone move you off the foundation of your faith. Always excel in the work you do for the Lord. You know that the hard work you do for the Lord is not pointless. Today we are going to be attending the baptism of several people. One of them is a special friend of mine! He makes me laugh and I don’t mean just a haha laugh-but a serious belly laugh! I love this kid! I am excited for him and for what God has planned for his life. I am also excited for his family-they have become dear friends to me. They have brought me joy and have revived my tired spirit. I have seen the twinkle of God in his parents eyes and it is a beautiful thing. The above quote IS this family-in more than one way! Finding our way to truth is never an easy process. It takes years, it takes people, it takes patience, persistence and perseverance. All truth comes from the same place and that place is GOD. God never lies. So when God says you are victorious-you better believe it! Sometimes it takes years to fully believe it. It’s not that we doubt God, but we doubt ourselves. We can’t do anything alone- but we can do everything through Jesus Christ. He is our foundation, our truth. When we stand upon this truth we are victorious! We must hold Him up as our banner all the days of our lives. His name is engraved on our hearts, minds and souls. He did that when he formed us in our mothers wombs. We are fearfully and wonderfully made by a God who deeply loves and cares for each one of us. He wants what is good for us and He knows the victory that awaits us when we place him first on our lives. What is a banner? It is something that announces an event that we see hanging over a street or that is held up on poles in a yard. It must be held UP. The Lord is our banner of truth -He is over our lives in everything that we do. How do we hold up the banner of truth? With help. First off we pray. We seek God’s wisdom in everything we do and then we DO with Him at the front of our minds. We do it with the help of others. When we get tired we need an intercessor, someone who will hold us up while we are doing this work. Let me give you an example. Today we will be attending the baptism of many people. After the baptism we will be eating. It seems as though a lot of what we do revolves around food. Food is important to nourish our bodies but we shouldn’t let it be the reason for our existence. God is that reason. The food gives us energy to do His work. So, at this picnic there will be food of all sorts and for me this food is a huge temptation to overeat, indulge and satisfy my sugar addiction. If I eat sugar I will become complacent, tired and lazy. I have a group of friends whom God has surrounded me with to help me with this issue. They will be helping me make the right food choices and when they do that-they are in essence helping me hold up the banner of the Lord. You see my heart’s desire is to be holy and pleasing to God in all areas of my life, especially in this one. I try and try and try and keep trying. I will eventually get it right, but I have found out that I cannot do it alone. In Exodus 17 we see the Amalekites attacking the Israelites. Moses told Joshua to choose some men to go with him to fight them. While they were fighting Moses would stand on top of the hill with the staff of God in his hands-asking God for enablement to overcome the enemy. Moses couldn’t do this alone-it was tiring work. As long as Moses had his arms in the air-they were winning, but as soon as he dropped them from being tired, they were losing. So God sent him Aaron and Hur to help him. They each stood beside him and held his hands up until the enemy was defeated. As Christians on the road together, this is what we supposed to do for each other. I want to defeat this addiction in my life so that I can have energy to do the work that God has called me to do. I can’t do it alone. I need an Aaron and a Hur-maybe even several! God has placed these people in my life and I am very thankful for them. While I am at work defeating this sugar addiction, I will come alongside others who need my help and I will help them. This is called a support group and I love the group that God has placed to walk alongside me, to encourage me and to help hold up my hands AWAY from the food! Yes I said ADDICTION. Sugar is my number one enemy. Satan uses it to cajole me into numbness. He doesn’t want me doing God’s work and he feeds me these little lies of how good it tastes and how one little bite won’t hurt me, knowing full well that this is my addiction and that I can’t stop at one bite. Just like an alcoholic can’t stop at one drink, or a drug user can’t stop at one needle, one hit, or one party. Like a drug sugar puts your mind to sleep and your body becomes numb, lazy and fat. Your zest for life is gone and your brain is clouded. The only way I can overcome my addiction is with help. Help from God and from a support group of like minded people. This is my victory! Where I stand determines my success. I can stand in the mountain of sugar or ON that mountain top with God and my support group holding up the Lord’s banner. We can’t do it alone. Today, we will journey to the river together for a time of baptism and celebration. We will hold up the banner of the Lord over the newly baptized and over one another as the family of God. Each of us has some sort of addiction that we can and will overcome. It takes time, persistence, prayer and the help of a strong support group. You can do it-but not alone. If you have a need, please contact me, I am hear to listen and pray for you and help hold up the banner of the Lord over your life. We were made for victory! Oh but isn’t He? He gave us all the seeds we need to grow the food that is good for us and doesn’t he send the rain to make the crops grow? Didn’t he give us instructions on disciplining ourselves? He also sends people into our lives to help us get prepared! Look at Noah, Moses , Abraham and Joshua. Today I want to talk about Joshua! Wow! Can you see it now? He mowed them down the same way I mow down chips at my favorite mexican restaurant! Haha! It’s not funny because both things are necessary to get me to this point. I needed to see how to “mow down” my own enemy-which is food-in order to move forward. God sent me warriors to help me see the way to do this. Just like Joshua chose the right people to help him be a success, God has placed certain people in my life to help prepare me for what is to come. Some of those people are cheerleaders, exercise nuts, recipe converters, encouragers, prayer warriors and personal trainers! I am amazed at how God has placed all of these people, at the same time, in the same place, in my life and in the lives of others who are on this journey with me. I am excited because God is preparing us for the battle of a lifetime-to live healthy and to be fit so we can do the work he has prepared for each one us. He will let us know when that time is and what the work is. I see him working out patience in each one of us. Diligence, perseverence and discipline. He is growing the fruits of the spirit in us- together. We are becoming the grapes on the vine. The vine holds us together-it’s name is JESUS. So, what does mexican food have to do with this? Well, as I said earlier- I love chips and sauce and on this night I did eat some but you know what? They tasted greasy in my mouth. Ugh. The sauce was like a hot bomb that went off and killed my taste buds. As I am eating them I am thinking, ” man, this is weird…I don’t really like them anymore.” So I stopped eating them. I had ordered the lunch portion of the chicken fajitas and I ate the chicken and the veggies, 1/2 the rice and some beans. I skipped the tortillas. It was good, but not as good as I thought it would be. That night my mouth tasted like a grease pit. I brushed my teeth several times before going to bed. The next morning all I could taste was grease again. It was gross. It took several days to get that taste out of my mouth. I have no desire to eat greasy food again. The funny thing is that I never considered it to be greasy! What is God showing me? That the desires of my mouth are changing and that he is showing me how to eat healthier so I can live a longer, fuller life. He has also done this with ice cream. I’ve been wanting black cherry ice cream for a few weeks now and I finally had some over the weekend. No cone-just a cup. It was the same way- it did not taste nearly as good as I had expected. So, now that I’ve had it and it was just “ok” I don’t really want it anymore. God is helping me “mow down” my enemy- FOOD! An order sheet for custom pieces will also be available at the meal. “Treasure right under your nose” by OOTBWC’s DONNA CATO! This is a FB post written by OOTBWC member DONNA CATO! We have a treasure right under our nose at OOTBWC and some don’t even know it. I can’t wait to meet the Lord face to face. I know He has got to have the best sense of humour ever. He makes me smile all the time, with all the ways that He gets my attention. This message is for the Soul Food Group, the Crazy Love Group, the Get Out of Your Seat ministry, and for all of us. God is just weaving a basket out of all these groups to carry “HIS” message to everyone we touch. First of all Brian told me “not to procrastinate” – so the Lord laid this message on my heart this morning and I said I’ve got to wait until tonight to give it, but then Chan’s words rang clear in my ears that I might not be here tonight, I may be with Jesus – face to face. I don’t want to die with a message locked in my mind/heart that He wanted me to give to someone. 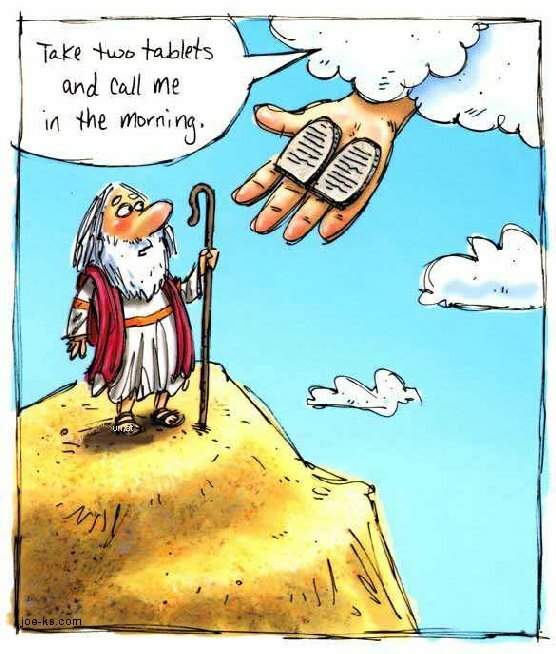 So here is the Lord’s sense of humour. My husband & I bought a treadmill off of Craig’s list about 3 years ago that has been used very little from a couple who used it for a clothes rack. Last night when Brian was giving me my work out plan we got on the treadmill and found out it does everything but wash the dishes. You can program it to elevate, do intervals, sprints, running, it is absolutely amazing. Brian has been home for 3 months, we’ve had it for 3 years and none of us knew what a treasure we had right under our nose. After we laughed about it, God led me to think about how I feel about OOTBWC . We have a “TREASURE” right under our nose and we have a choice to make. We are going to have to either turn it into a clothes rack, or get off our seat and run with it. God left us with “The Great Commission” . . . go ye therefore, into all parts of the world and give them the gospel message of Jesus Christ. God is here, right now, with us – He is our “Treasure”, but until someone opens the box for you and lets you see what’s inside it’s just a box. The Word says not to put your light under a bushel, but to let it shine so others can see. So many people at OOTBWC are writing, talking, sharing and inspiring others with what this ministry is doing for them. I am grateful to God for giving us all this technology, FB, IPhone’s, Twitter that we can use for good, for His Glory to take our message out and open up that “Treasure Box” that is right under so many people’s noses and they don’t even know it. We live in the Bible belt and there probably aren’t many homes that don’t have a Bible somewhere in the house. Inside that Bible is the Greatest Story Ever Told, the truth about Jesus, our Messiah and what He did for all of us; unfortunately, in so many homes, it is just like my treadmill, sitting there – collecting dust – and the owner doesn’t even know what it does. You have to open it up and see the Treasure inside that, when applied to your life, will transform you. My brother and sister-in-law live in Poulsbo, WA. When we visit, I am always so inspired after going to their church. It is HUGE and has so many mini-ministries within the main church. I would always come home wishing we had one of those here in Carroll County VA. Now I’m thinking after Ronnie’s message about building our church . . . you know, someone had to have a vision first and open the box to give that vision to a “few”, who realized what the treasure was and grew it into a reality. I see that happening at OOTBWC. You know what my vision is? I love this county, I love Virginia, I love where God has planted me. I too now have a vision, and it is for OOTBWC to fulfil the “Great Commission” in our community, right here in Carroll County. Can you imagine how we could change the world if people made occupational choices after prayerful consideration of where God wanted them to serve Him – if they made home purchases based on the church where God wanted them to be – if we had a vision to build OOTBWC into the kind of church that has so much impact on our community that Carroll County Virginia is known all over as the beautiful spot in the mountains where OOTBWC is! Now folks that’s a vision! Does anybody believe we can do it for Jesus? I do! It’s already happening. Don’t be afraid to share what is happening in our church with everyone you see. Trust me, there are people listening, longing to hear your enthusiasm. You see when I moved to this area 27 years ago, I wanted to find a church and I listened everywhere I went to see if I could hear anyone talking about their church because I didn’t know anyone here. I wanted to hear the enthusiasm from someone whose church was on fire for Jesus. I’ve got to tell you that 27 years later . . . OOTBWC is the first one I’ve seen. We’ve got to run like it is our last lap to the finish line, because it may be. Let us all work together to bring it home for Jesus – Bring home the trophy – souls saved – lives changed – Glory to God for the “Great Things He Has Done”! I woke up early today with the thought of Moses and Mt. Sinai on my mind. We spent last weekend motorcycling all over the mountains of NC and VA. 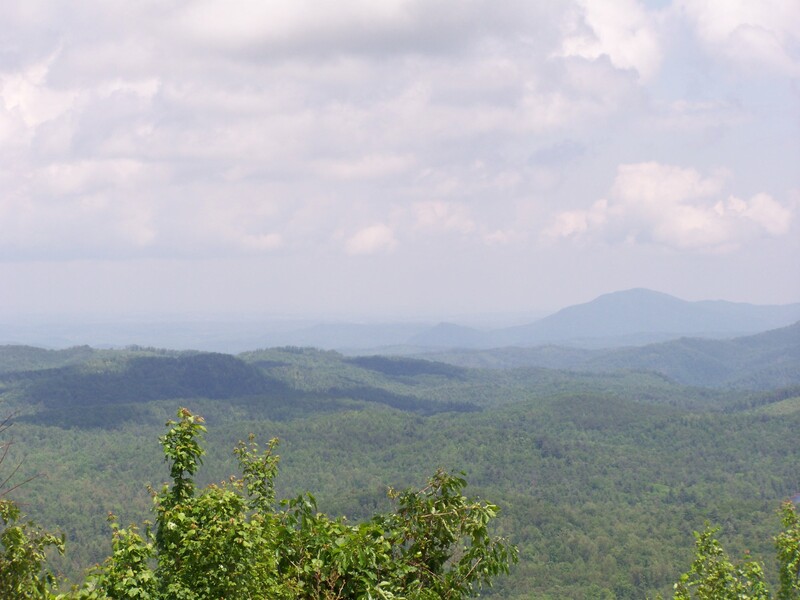 The highest point was at Craggy Mountain on the BRP. 5600′. We were literally IN THE CLOUDS. The view from there was amazing! I know how I felt being on top of that mountain and I can only imagine how Moses must have felt being up there AND being able to talk to God! It’s no wonder his face was radiant when he came down! I know that my little jaunt to the mountains has brought me to a place of renewed joy. God always shows me something when I am on my motorcycle-that’s why I love it so. I think it’s called PERSPECTIVE. 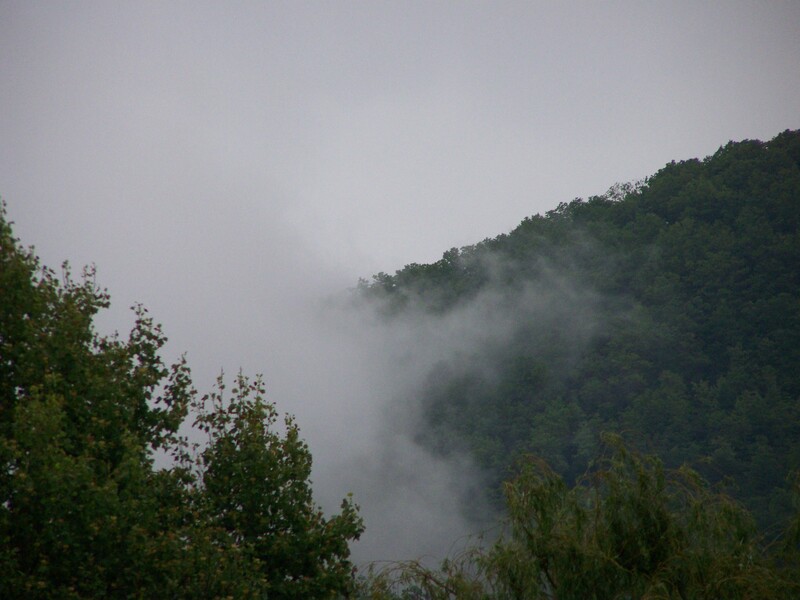 When I was on the mountain I could see, breath and hear God so clearly-there wasn’t anything to get in the way. My vision was clear and bright. I was in the clouds and nothing else was on my mind. Coming down from the mountain brought an array of challenges that made me want to turn around and go back. But, if I went back, I wouldn’t be able to get home or get through the challenges. As I came down the mountain I was very aware of how alert and ON I had to be. There could be danger at every turn and I had to be prepared. No sleeping on the job. My position in my seat was upright and my eyes were on the road ahead. I could not look around and if I did I would veer off the road and we all know what that means! My eyes were set on the goal and the goal was to reach the bottom safely. I can’t even fathom what went through Moses’ head as he descended Mt. Sinai ( 7500′) but I am sure he was excited to share God’s revelation with the people at the bottom. When he got to the bottom he found out that the people had made a golden idol to worship. How disappointing. Moses was faced with many challenges as he descended the mountain. BUT! That did not stop Moses from doing what God called him to do. He pressed on and did the job that was before him- never giving up. We are to do the same. One of our challenges was being slightly lost. ha! We had an old map and we just couldn’t find our way around this mountain that was looming ahead of us on the road. Yes, a real mountain. If we went one way we could go over it, and if we went another way we could go around it. For whatever reason neither of us was comfortable with going over it and I believe that was the Spirit of God talking to us and telling us to go the other way. We did stop and buy a new map and ask for directions. We were told that the easiest and quickest way was to go over the mountain. Still, we didn’t feel comfortable doing that. Again- I believe that was discernment. So, after looking over our new map we ventured around the mountain and we made it quicker than I imagined we would. So, what did I learn here? We can’t move the mountain, but we can find a way around it. We also need to be reading the right map, the map that has all the roads on it and the one that leads to home. If we are reading the wrong map we go the wrong way. This is why our bible is so important to us-it tells us the WAY to go and it speaks of the TRUTH. If you aren’t spending time in your bible everyday- I suggest you start. It WILL lead you home! Yesterday I was reading about the the paralytic man being healed from Mark 2. Here is the scripture from the Amplified Bible version. 1AND JESUS having returned to Capernaum, after some days it was rumored about that He was in the house [probably Peter’s]. 2And so many people gathered together there that there was no longer room [for them], not even around the door; and He was discussing the Word. 3Then they came, bringing a paralytic to Him, who had been picked up and was being carried by four men. 4And when they could not get him to a place in front of Jesus because of the throng, they dug through the roof above Him; and when they had [a]scooped out an opening, they let down the [[b]thickly padded] quilt or mat upon which the paralyzed man lay. 5And when Jesus saw their faith [their confidence in God through Him], He said to the paralyzed man, Son, your sins are forgiven [you] and put away [that is, the [c]penalty is remitted, the sense of guilt removed, and you are made upright and in right standing with God]. 7Why does this [d]Man talk like this? He is blaspheming! Who can forgive sins [[e]remove guilt, remit the penalty, and bestow righteousness instead] except God alone? 8And at once Jesus, becoming fully aware in His spirit that they thus debated within themselves, said to them, Why do you argue (debate, reason) about all this in your hearts? 9Which is easier: to say to the paralyzed man, Your sins are forgiven and [f]put away, or to say, Rise, take up your sleeping pad or mat, and start walking about [and [g]keep on walking]? 11I say to you, arise, pick up and carry your sleeping pad or mat, and be going on home. We have never seen anything like this before! The thing that struck me was when the men couldn’t get their friend to Jesus they found another way. They were determined to reach their Savior. The desperation of their friend became their determination. They put their faith into ACTION. They didn’t sit around and say, “oh that’s too hard, or I can’t get there from here, or he’s too heavy to carry to the roof.” They just did it. I want a faith like that. I see this faith at OOTBWC and it amazes me, just as much today, as it did to them back then. People are hungering for Jesus and they are seeing, feeling and experiencing him in a new way. It isn’t anything we are doing-it is what GOD is doing through each of us. We are just being who we were made to be. God has put each of us in this place to do a job-just like these men who lowered their friend though the roof. God put them on the roof to get the job done. We are doing the same thing and people are meeting Jesus for the very first time. It is amazing to watch the transformation of the people who come through the doors. I’ve never experienced anything like it before. The desperation of the world should be our determination to get people to Jesus anyway we can. Even if it means doing something different like digging through the roof! Every week I see people who are rising from their mats and are jumping for joy because they have found something they were missing. It’s like finding a hidden treasure in your closet-it’s been there-you just didn’t know where it was! The fun begins when you can be there to watch them open that treasure and embrace the gift that is inside. It is through the Life Groups that they begin to realize the gifts and talents that God has put inside of them and we are blessed by being able to build beautiful new friendships with them as they blossom and grow into God’s precious creation. I stand amazed and I thank God for what he is doing through each of us as people are rising and picking up their mats…some are walking, some are running and some are jumping for joy! I’m jumping with them-how about you? So, I’ve been wondering today…how many times do we try to help others do the right thing? You would think that having just finished studying the OT I wouldn’t have to ask myself that question. But I did. The OT is proof that God never gives up on us. Ask Noah, Abraham, Moses, Joshua, Matthew, Mark and Luke! The fact that we are here today is proof that he never gives up on us. So, why would I think about giving up on myself or anyone else? Doing the right thing takes prayer, persistence, perseverance, patience and ACCOUNTABILITY! We cannot expect ourselves or others to do the right thing alone- God gave us each other to help each other. 7 x 7 x 70. We are to do just that. Over and over and over again. Yes, it is frustrating, yes it gets old, yes, yes, yes. But what God does not want to hear from us is NO we won’t help-ourselves or others. Helping doesn’t mean enabling-it means praying, teaching, witnessing, holding people accountable, and then doing it all over again. God sees each of us as His precious child and we all have issues of some sort that God hears about over and over and over again. Does he leave us? No! Never! Does he hold us accountable and responsible? Yes! Does he discipline us? YES. Does he send us help when we need it? Yes! Most of you reading this didn’t know me growing up. I was a wild child! I am sure that there were times when my parents wanted to just throw in the towel, out of sheer frustration, over my bad choices and desire to be a wild child. But did they? NO! Never! I am so thankful that they didn’t! They knew that I was a precious child even if I didn’t know it. I wonder how many people out there, reading this, don’t realize how precious they are to God and how much God yearns for them to yearn for Him? He wants us to be head over heels in love with Him so much that we will want to do the right things no matter how hard it is. And when it gets hard-he will send someone, maybe even “several someone’s” to help us get out of our own way. But we cannot and we should not ever expect to have to do things alone. As God’s children and family, we are a team and we need to act like a team and we need to think like a team. God is our coach. Are we listening to Him? or are we listening to the world? People are losing themselves to things that are not of GOD out of sheer loneliness and desperation. These people live all around us-each one of us knows someone in some kind of need. Instead of griping and moaning about all the things that are wrong-why don’t we just get up, get out of ourselves and go help someone who needs it? It may be someone you’ve already helped-help them again. It may be someone you don’t even know-introduce yourself-it may be someone in jail-write them a letter-or it may be the lonely widow in room 210 at the nursing home- make a visit- or it could just be that lonely kid in Burger King who needs a hamburger-buy him one and then sit with him/her and build a relationship and watch GOD WORK! In fact- I double dog dare you! Here we are on top of Craggy Mountain. To the left of Cort’s head is one of 6 tunnels that we went through. All had ice warnings and were extremely dark inside. It was a little disconcerting entering one- even with the headlights on. It gave new meaning to “there is light at the end of the tunnel…” It was very cold and we were really bundled up! This is one of many curves we maneuvered! Life is journey and all of our journeying should lead to God-does yours? 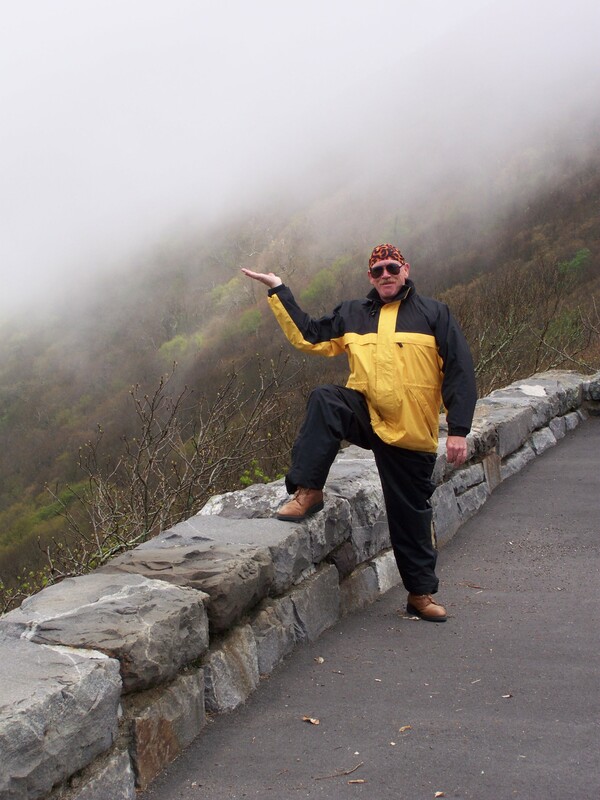 Here’s my man holding up the clouds! He is just grinning! This was taken on top of Craggy Mountain on the BRP. We rode through the clouds on this day and when we got to the top I let out a yippee! It was exhilarating! Cort always says that being on the motorcycles makes him feel ALIVE and I have to agree! This spot was amazing and if you ever get a chance to get up there- do it! You will be amazed at how different the landscape is and the beautiful views that God has laid out for us to see. Riding my motorcycle with my hubby always brings me closer to God. It is hard to explain in words. Every moment counts and there is adventure at every turn, with every mile, and with the shift of every gear. You have to be “full on” to be on a trip like this. No sleepy heads, no distractions, all out adventure. In that adventure there is excitement as well as danger. 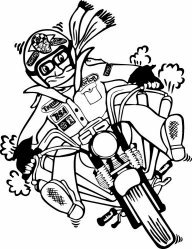 I always say that if you ride a motorcycle you need to get right with God before you get on it. There is danger everywhere and we need to be right with God regardless of what we ride or drive. I pray that you are… because being right with God is the biggest adventure you could ever be on! Cort and I traveled to the Great Smoky Mountains this past weekend on two wheels! 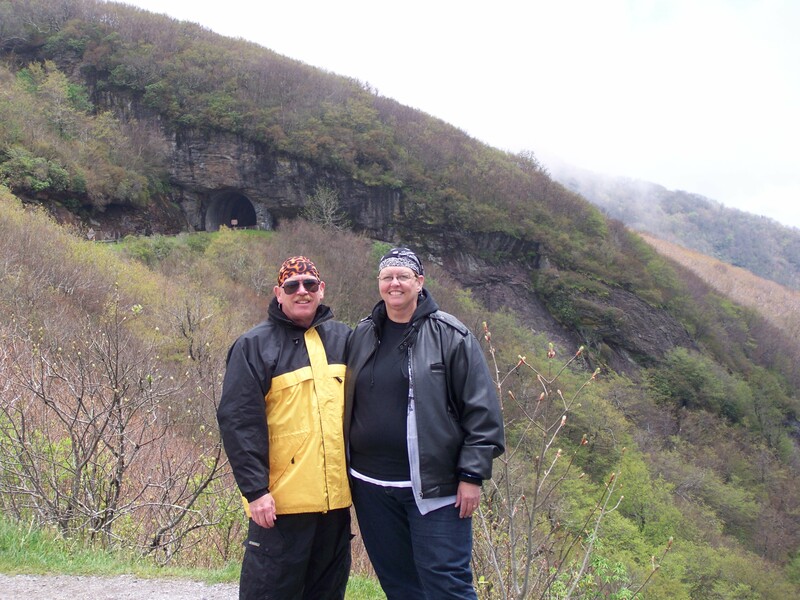 Our main objective was to ride the ominous ” Tail of the Dragon.” We had watched videos and looked online at pictures and had met some people who had been there and that made us want to go ourselves. Most folks around here kinda shrugged and said, ” it’s just a road, go once so you can say you rode it.” So we did. After riding it we both understood the comments that people had made to us before the trip. 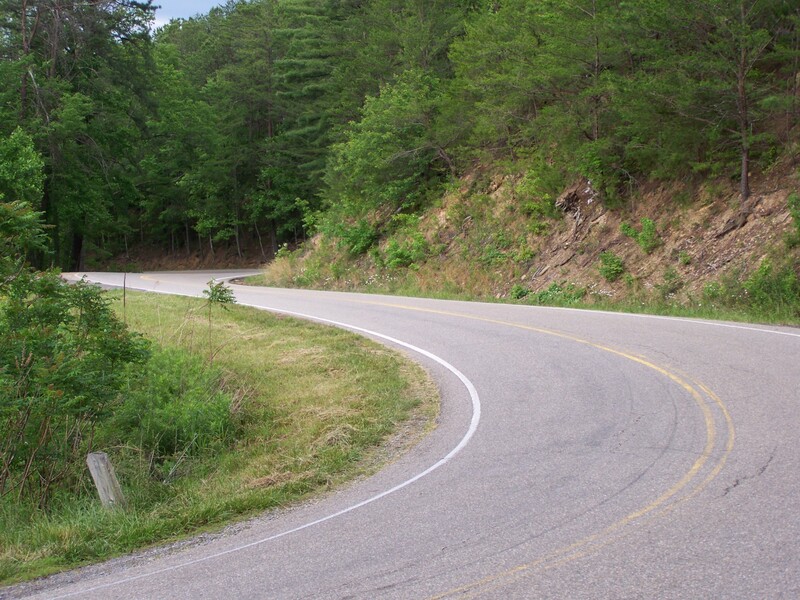 If you ride in Southwest Virginia-the Tail of the Dragon is no big deal. But, if you are coming from a place with straight roads and no mountains-it is a big deal! So, it depends on your perspective and where you live. For us, it was a great ride on a winding road. 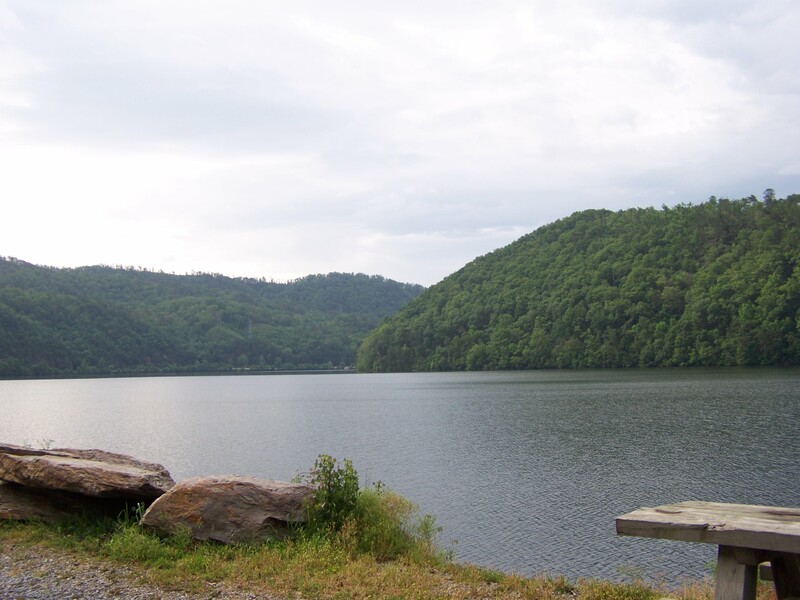 It is no different than Squirrel Spur, Orchard Gap or Piper’s Gap. It has been very well marketed and maintained. It is a wonderful ride through the Smokies with beautiful scenery! The morning we rode was quiet and we didn’t meet many bikers at all-NOT what we were expecting !! I am sure the weather had something to do with it- cloudy and overcast- but no rain. We passed the Fontana Dam and had to stop for a picture! Impressive! means “beautiful waters.” It was gorgeous! There was a gas station there also and we noted that there was high power fuel for the serious sport bikes- it was $7. 69 a gallon!!!!!!!! Phew! Our gas-premium- was $4.29! A little higher than here. From here we went to the Cherohola Skyway-over hill and dale through some of the prettiest country I’ve ever seen. The tallest mountain is where we were headed!